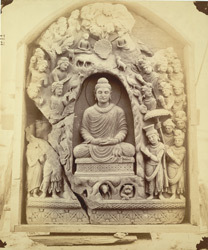 Photograph of a Buddhist sculpture from Loriyan Tangai boxed for transportation and depicting Indra's visit to Buddha at the Indrasaila cave, taken by Alexander Caddy in 1896. Indra is the figure on Buddha's right wearing a tall hat and shaded by an umbrella. Buddha is meditating inside the cave with flames surrounding him signifying his radiance and animals outside the cave depicting the peacefulness of nature in Buddha's presence. This style of sculpture, influenced by Graeco-Roman elements, is known as Gandharan and takes its name from the ancient kingdom of Gandhara (Peshawar) which, together with Udyana (Swat), corresponded fairly closely to the northern part of the North-West Frontier Province.